This our one more tutorial in Codeigniter. In this tutorial we will discussing on how can we check email is available for registration or not by using Ajax with Jquery in Codeigniter framework. In most of the website registration we have use email for identify for login into system, then at that time we want to check particular email is already register into our system or not. So it is very important task to check email is already register or not at the time of registration. 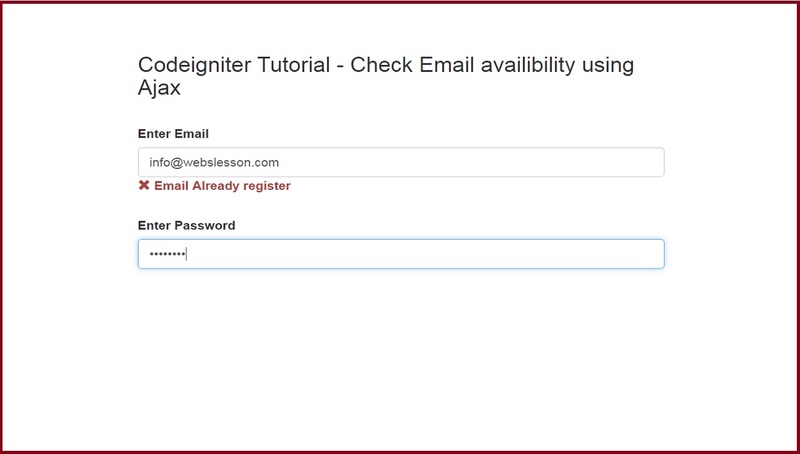 So In this video we have seen how can we validate email already registered or not in codeigniter application by using Ajax with Jquery. Here we have simple load register page from controller and then after on that view page we have write jquery code on textbox change event. So when we have enter email and go to password field then jquery code execute and in that code we have make ajax request and by using we have send request to controller and in controller first we have check email is proper or not if email is proper then it again check email is available in database or not so it go to model and in it will check email register or not and send result to controller and controller send result to view page. So This way whole cycle of codeigniter framework will run for checking email register or not by using Ajax with Jquery.